Contest open to U.S. 48-contiguous states only, ages 18 and over. Winner has 24 hours to respond to my email titled – make sure to check your spam. Failure to respond will cause winner to forfeit the prize and a new winner will be chosen. Please note that prize can take up to 6 weeks to be received by the sponsor. No Purchase Necessary to enter. This giveaway is in no way affiliated with Facebook, Pinterest, Youtube or Twitter. One entrant per household/IP address. I like the size of it. Not too big. I love the part where you drop the water in and it comes down like a slide. this is a very cute idea because kids can put small figurines on there so they could water slide. I love the Side flipper launches Dory & Friends into the water. So much fun! The slide is my favorite feature. The water slide is awesome! My favorite feature is the slide and I love that it can be used both indoor or outdoor. The extras that come with it. I love the ‘water slide’ feature. I love all the characters it features. Grandkids love Nemo! In the sign up for exclusive step2 emails I inadvertently put a space after the last m and before the @ symbol in my email. Is there anything that can be done to fix this? I love that its colorful and has my childrens favorite Finding nemo characters, also that it combines water with play. I love all of the accessories that comes with it. It just the perfect size. This would be perfect for my grandson for this summer. I know he would love it. 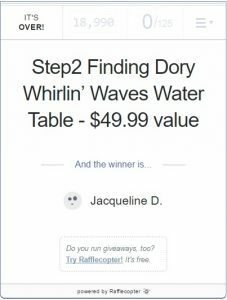 The Whirlpool Spinner will be a favorite, I am certain for my little niece and nephew. I really like the slide and the cute little characters! The characters are my favorite. We are huge fans of Dory & Nemo. We can’t wait for the new movie! I really like the size of the table. I love that this is nemo/Dory themed. I like the 3 squirting toys that come with it! I like the center whirlpool spinner feature. 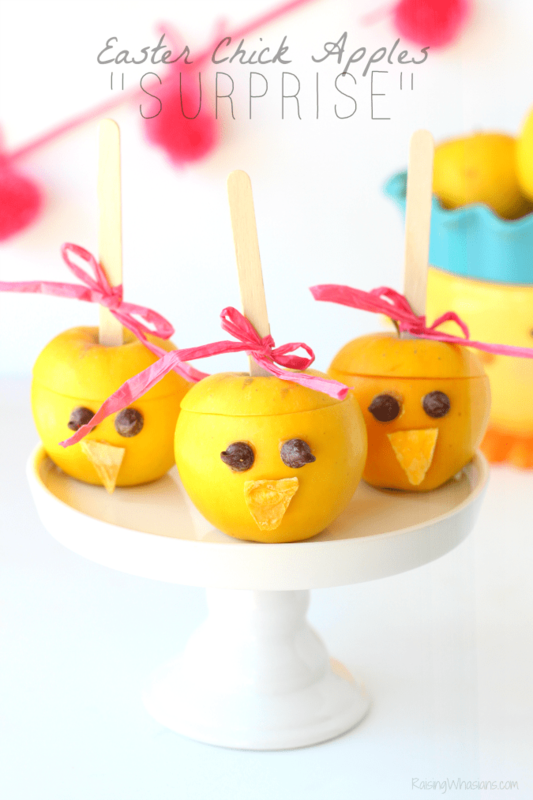 My nieces would absolutely love this. My favorite feature is the whirlpool spinner. My favorite feature would be the slide! The kids would have so much fun with this! I love the squirting toys that are included! It’s a great size and so happy it is related to a disney pixar movie! My fave feature is the slide. I can totally picture my son LOVING this. I like the Disney theme that it has. I like the side flipper to launch them in the water. My son would love it! It’s super cute and I like that it has a drain plug to make cleanup a breeze. Thanks. Love the toy launcher lol. My kids would go crazy with flipping their toys. This would be an ideal toy for my son. It is just perfect for our yard. Love It! I love the water slide on it! I love Dory. Can’t wait for the movie to come out. My daughter would love this. My favorite feature is that it looks like its a bunch of fun! And that the kids will keep busy playing so I might be able to grab a bit of sun myself. Love the cute character toys! I love that it comes with characters. My favorite feature is that it’s a learning tool! It’d be great for tactile learning of cause an effect for my toddler son! I like the cute toys and launcher! Love that it is not too big! I like the slides that the characters can go down. My kids would love that! I love that this helps with motor skills! My son would absoultely love this. He loves anything with water! I like sliding water and the size is perfect ,not too big and not too small,would love it for my 1yo baby! I love the wave spinner as well as the little character toys. 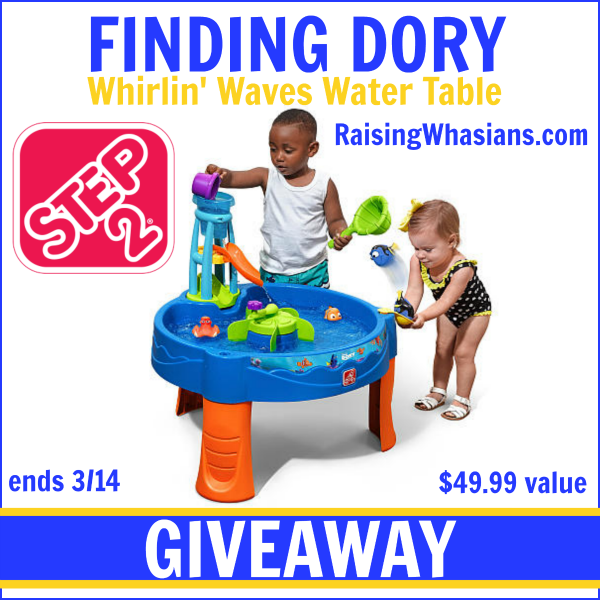 My favorite feature is the Whirlin’ Waves Spinner, it looks like fun! As a grandparent I love the easy setup part. I might not want it set up all the time, but could quickly set it up when the grandprincess comes to visit. I love the theme and the slide. My oldest is about to turn 3 she loves playing with water thus would be awesome! I love that this water table provides so much action. My granddaughter plays with a plain old water table from a garage sale. She would love this. The slide & launch look great! The water slide and the dory are my favorite!!! I like the water slide part. The water slide 🙂 The colors are nice too. My favorite is the easy set up which can be done in 10 minutes. It looks so fun! My son would love it. I love that it is the finding nemo theme and its not too big but not too small either. My son LOVES finding nemo and anything to do with water so he would be in toddler heaven. I love the 3 Finding Dory Themed Squirting Figures. I love the height! My little guy can easily play without a problem! I love the characters that come with it! This just looks wonderful for my 3 littles! I have three 3 and under and have been meaning to get a water table for a few years now. This one looks so cute! I like the water slide/spout part. 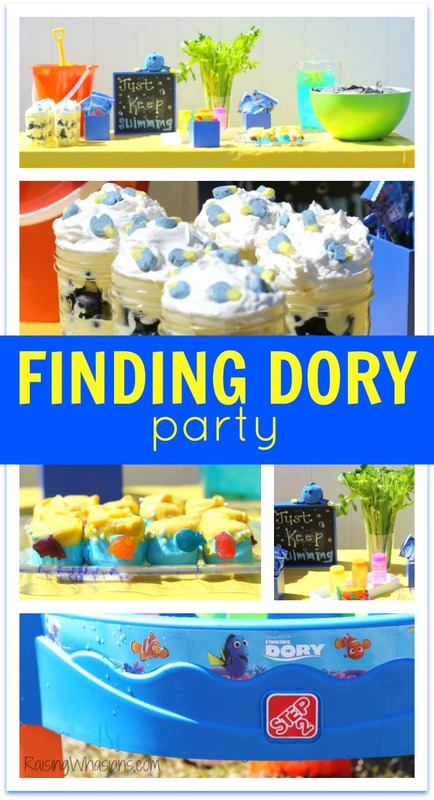 I also love that it’s Dory themed. I like the slide. Really cute. I love that it features Dory, one of the cutest characters from Finding Nemo. Favorite feature would be the water agitator. I can see my 2 year old cranking that sucker around and around and around and around and……. I love the easy set up and the activities included such as the spinner. the Finding Dory characters, what child does not love finding nemo! I love the characters on it and the size! It looks like a lot of fun for a hot day and all the while good for learning too through sensory play. I like the waterslide part of it. I love that the little fish can go down the slide and that the kids can have fun making the water spin! I love the water slide feature. i like the water slide part! keep it moving! I like how it has squirting figures. How fun! My favorite feature is the whirlpool spinner and the squirting figures! 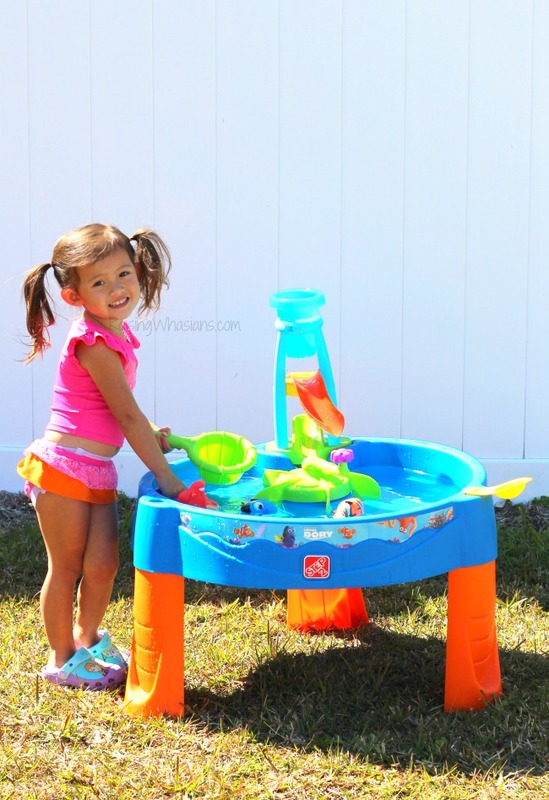 I love that this water table comes with an 8-piece accessory set! My Granddaughter would love the slide and playing in the water in general so this toy is one of my favorites for kids. My daughter would love this; the slide is soooo cool! I like all the activities that come with it. I follow you on Instagram accidently put my email address instead of my name my kids distracted me! I love the characters and the slide that it comes with! It looks like my daughter would have tons of fun with it! They would love the water slide. This would be fun. My favorite is the side flipper. The best feature to me is having a plug to drain the water table after my four little grandchildren splash and play all day! My favorite is that the water table has a plug to drain the water after my four grandchildren have fun splashing around in it all day! I love the cute Finding Dory print! It’s a fun look. The best things are easy set-up and easy drainage. I love all the characters it comes with! It would be fun! I like the waterslide part of the table. My favorite feature is all of the accessories, the slide is really cool. My favorite feature is the small toys, love that the child can interact and have fun playtime during the summer months. I think the kids would like the center whirlpool spinner the most. I like the slide and the spinner on this water table. My favorite feature is the center whirlpool spinner feature. I love that Dory is featured on the product. My favorite feature is the slide because I can imagine my nephew having a lot of fun sliding his toys down it. I love the water slide on the table. The slide is so cool! I love that this comes with the figurines and the 8 piece accessory kit. i love the character stickers on it.